Have you ever experienced the frustration of attempting to share your job board link on social media to only find the images are distorted, or even worse, include some random image that isn’t applicable to the shared page? 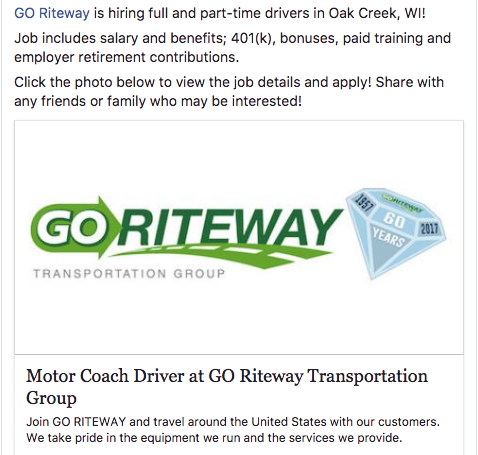 This is an example of a job board that is currently advertising one of their clients job postings through Facebook and you can see how the logo is completed distorted to which the brand name is not recognizable. Understanding that most employers wouldn’t be happy if they saw this post and for the job board, this leads to lower click-throughs and views. This is a good example because the job board included a large enough photo in their ‘og:image’ that will have the logo display prominently instead of the smaller box as shown in the previous example. And, the job title and company name are both included in the primary text with a short description of the job posting. If you have experienced a similar challenge when sharing your jobs on social media, check out a recent tool by Facebook; Sharing Debugger. The Sharing Debugger is a helpful tool because you can enter any URL you wish to share and Facebook will provide you with a visual display of how the link will appear and recommendations on improving the link properties regarding the Open Graph Markup. By implementing Open Graph tags on your website, this will allow your business to control what content is shared across social media sites like; image, title, url, description, type and locale. Making adjustments or adding Open Graph Markup is an important task for your job board because you can boost the conversion rates on your social media posts and/or advertisements. As mentioned by Facebook, the carousel format improves ad performance with 30-50% lower cost-per-conversion and 20-30% lower cost-per-click. What adjustment could you make on your job board? Ensure all employer logos are uploaded and set to a standard size (recommend square dimensions like 400×400). We hope this information helps alleviate challenges your marketing team may be having when attempting to share your jobs across social media sites. If you are interested to learn more about our job board technology at JOBartO, please email info@jobarto.com or call (561) 503-2022.